Okay, so you just ate dinner and you want something sweet, but you don't want to go too overboard because you're already full and.. well, you don't want to feeeel gross (even though, no regrets ever after dessert, am I right?). So what do you do? 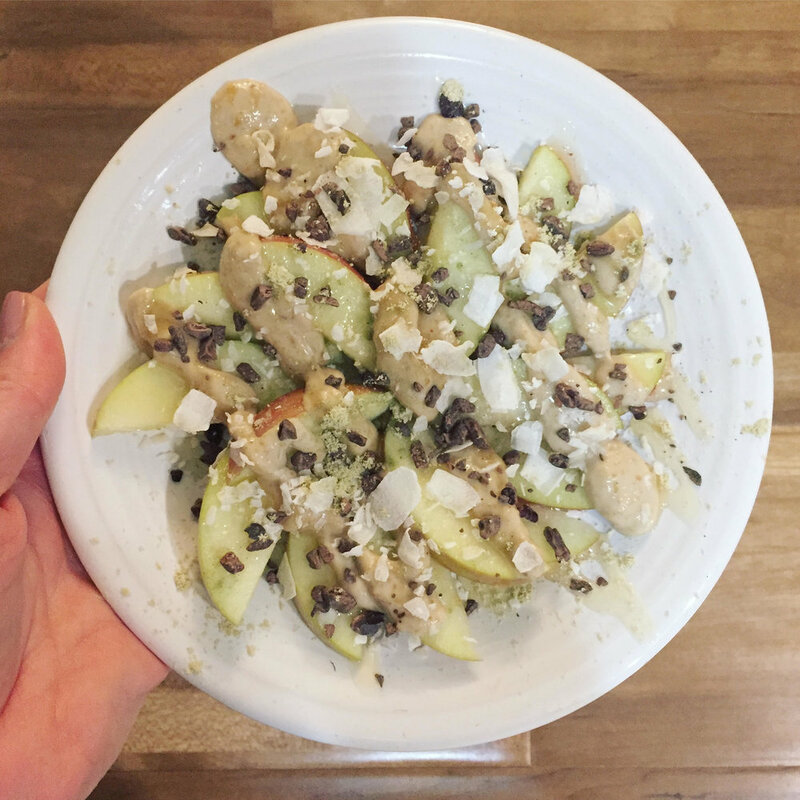 Make these sweet apple nachos! They're sweet, creamy, a little savory and a little nutty. 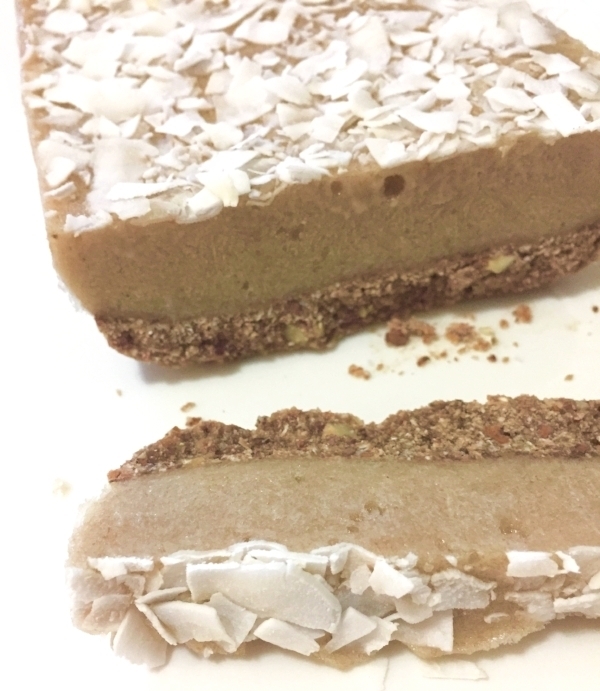 If you don't finish the whole plate, you can just cover the plate and leave them in the fridge to eat the next day, but the best part about these is I never feel sluggishly full after eating this healthy dessert! So you're not wanting a dessert? Eat this as a snack! This would also be a great pre-workout snack. But yes, what I'm saying is that you just need these sweet nachos in your life basically no matter what. Core and slice the apple into semi-thin slices. Then layer the slices out on a plate, like you would chips for typical cheesy nachos. Next, melt the coconut oil. In the bowl with the melted coconut oil, add the nut butter of your choice and stir until the two are fully combined. The texture should be a creamy liquid, almost the consistency of a loose batter. Drizzle the nut butter coconut oil mixture all over the apple slices. Then drizzle the honey or maple syrup over the apple slices. To finish your sweet apple nachos, sprinkle all remaining toppings evenly onto the apple slices. Eat immediately, share with a friend, or cover and store in the fridge until the next day. Enjoy! Don't like some of these toppings or want to add more? The possibilities are actually endless with this one! Share your creations with me on Instagram by tagging @the_health_hustle in your stories and posts. These balls taste like nutty raspberry cheesecake bites! They're super creamy and naturally sweet, but not too sweet. Because they're also frozen, they make for a good, small treat any time of day, or they are even as a pre or post workout snack. Just peel the paper cups off and enjoy! Melt the coconut oil in a large bowl. Once fully melted, mix in the almond butter. Stir until fully combined and when the almond butter has somewhat "liquefied". Stir in the collagen powder and salt until they both are completely dissolved. Lay out a small cupcake pan and then line each pocket with small paper cupcake cups. Separately, crunch the coconut flakes into smaller pieces and then lightly sprinkle them on top of each bite. Once all of them are filled and topped, tap the pan on the counter a little to get any air bubbles out and to let the coconut flakes settle into the mixture more. Freeze for a minimum of 6 hours, or until fully frozen. Once frozen, pop them out of the pan and store in the freezer until enjoying. My favorite collagen powder to use is the Further Foods beef collagen, and is the kind that I use in all of the recipes that I use collagen in. As for the dried coconut flakes, I like to use non-sweetened flakes, but the naturally baked Bare toasted coconut chips are slightly sweetened which gave the bites a sweeter, crunchier top. I love freezer treats. But to be honest, popsicles and ice cream are not always the things that I crave in the heat of summer (I mean, sometimes, but not often). Even though I still do eat them occasionally, the high amount of sugar and dairy products leave me feeling just bleh for the 24 hours or more following the indulgence. Yes, 'bleh' is the best way to explain it, but to be more detailed, I get headaches (not brain freezes) and my stomach gets all weird and bloated and sick feeling. So yeah, I don't always reach for them when I go to the freezer for something cold in the summer, but this is why I often keep my own homemade treats on hand. With summer coming up and the heat slowly turning on here in Oregon, I have been needing to stock up on some freezer treats, especially chilly, refreshing ones. After having a mass of overripe bananas recently, I wanted to do something fun with them (other than doing the usual and freezing them for smoothies), so I thought, 'why not make nice cream?'. And then - since you all know I love food bars and eating with my fingers- I thought to myself "why not nice cream bars?!". So here you go! Refreshing banana nice cream bars. The base is a rich, creamy, nutty, protein and healthy fat filled nugget and the top is a chilly, slushy, banana-y sweet nice cream. I like to enjoy these in slices, cut them up into little bites and keep them in the freezer for mini treats, or to use as toppings. I hope you enjoy them! Stay cool, my friends. To make the banana nice cream, blend the bananas and coconut water (or liquid of choice) together until smooth and creamy. Pour mixture into a shallow dish and stick into the freezer to chill while the crust is being made. Pour the 'dough' into a mixing bowl. Add the coconut flour and mix. Line a bread loaf pan with parchment paper. Take the banana nice cream out of the freezer (some parts will be frozen but most will still be a liquid) and pour/ scrape it over the crust. Pat the pan down a few times to pop any bubbles that may be in the banana nice cream from pouring and to evenly distribute it over the crust. Freeze for at least 8 hours, or until the banana mixture is fully frozen. To enjoy, take the whole bar out of the pan by pulling up on the parchment paper sides. Then cut it into slices (like you would a loaf of bread) or into bite size pieces. Enjoy immediately or keep in the freezer until you do. To make vegan/vegetarian: Substitute 1 Tablespoon of a different flavorless protein powder or nut flour of choice instead of using the 1 Tablespoon of collagen powder (step 3). Make sweeter: The crust is a rich, nutty, savory flavor that, alone, some people may think is too bitter. The naturally sweet banana nice cream balances it out when eaten together, but if you want to make the crust itself sweeter, add 1 or more Tablespoons of honey, coconut sugar, agave, or maple syrup to the base when blending it (step 3). Other toppings: Other things such as dried, chopped nuts, seeds, cocoa nibs, coconut sugar, or a nut butter drizzle would be great over the top as well or instead of the coconut flakes (step 9).